With “Crazy Rich Asians” – the adaptation of Kevin Kwan’s immensely popular book of the same name – currently lighting up screens across the United States, one must remember that it isn’t a single all-encompassing attempt to portray the Asian American experience. It should instead be considered the latest in a series of stories increasingly shining a spotlight on filmmakers and real-life subjects. We’ve covered a number of film festivals and events highlighting such efforts over the years, and have decided to dig through our archives to give another shoutout to just a few of the many people and works that have paved the way for “Crazy Rich Asians” – and hopefully more stories on the big screen in the near future. The following list is by no means a comprehensive timeline, but rather a select list of articles and interviews featuring personalities ranging from well-known filmmakers to first-timers. The years listed correspond to movie release and event dates, not publication dates. Japanese American actor James Shigeta made his film debut in Samuel Fuller’s “The Crimson Kimono.” Shigeta’s presence was notable for several reasons. His character gets tangled in a love triangle with his fellow two leads played by Glenn Corbett and Victoria Shaw – and he, not Corbett, ultimately wins the girl. Shigeta’s heritage, both on screen and off, allowed Fuller to shoot in the historic Little Tokyo district of Los Angeles. He spoke without a stereotypical broken accent in the film. And finally, for his work in “The Crimson Kimono,” he was a co-winner of the Golden Globe for the Most Promising Newcomer – Male in 1960. “Chan Is Missing” is the 1982 landmark film directed by Wayne Wang (who went on to direct “The Joy Luck Club,” the last mainstream feature film starring an Asian American cast before “Crazy Rich Asians” was released a quarter of a century later). 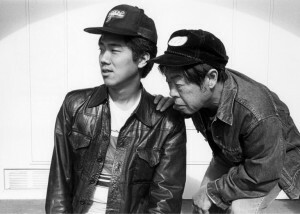 Using the frame of a very simple basic plotline and a very familiar mystery/film noir genre, Wang tackled the kinds of subject matter that would concern other Asian American filmmakers that followed in his wake: cultural identity, assimilation vs. being viewed as “other” or “foreign,” and generational conflict, among other issues. 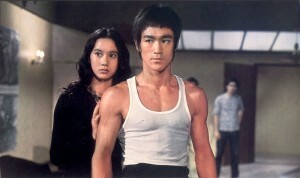 “Chan Is Missing” was re-released in a new 35mm print last year. Actress Michelle Krusiec made her mark in film with the lead role in “Saving Face,” co-starring alongside Lynn Chen and Joan Chen. We spoke to her during her performance run of Made in Taiwan at the 2010 New York International Fringe Festival. Sean Baker and Shih-Ching Tsou’s raw and energetic film “Take Out” has an unusual protagonist, one that most of us have had encounters with, but few of us think much about: the Chinese take-out delivery man. Baker went on to direct some titles that were highly lauded on the film festival circuit, including “Tangerine” (2015) and “The Florida Project” (2017). 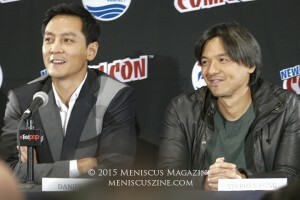 In 2006, we spoke to “American Fusion” director Frank Lin, who said, “You don’t have that responsibility like there is only one Asian American film out there so you have to express [and] represent for every Asian American.” Fun facts: the film co-starred Sylvia Chang and Esai Morales, and the script was co-written by Lin and Randall Park, star of the television series Fresh Off the Boat. “The Slanted Screen,” a documentary focusing on the image of Asian American masculinity in film, was directed by Jeff Adachi. Filmmaking is not Adachi’s main pursuit; he now serves as the elected Public Defender of San Francisco. Formerly of Asian CineVision, Risa Morimoto directed “Wings of Defeat,” a documentary that sheds valuable light on one of the most notorious yet least understood aspects of World War II, the Japanese pilots known as kamikaze. Every year, Asian CineVision and the Asian American Film Lab run the 72-Hour Film Shootout, with the winners’ short films screened at festivals and on television. We wrote a recap of the 2008 event (disclaimer – several of our contributors have placed in the Top 45 at past events). Ever since his 2003 science fiction film “Robot Stories” swept numerous awards on the film festival circuit, Greg Pak has not only continued to make movies, but these days primarily spends his time as a comic book writer for Marvel and DC Comics, also championing diverse characters in his work there. One of our articles on Pak highlights “Happy Fun Room,” a short film that is part of the FUTURESTATES independent science fiction film series. Grace Lee’s documentary “Off the Menu: Asian America” looks at several personalities and practices that comprise a very small part of a complicated culinary landscape in the United States. Featured restaurants include the Nom Wah Tea Parlor in New York and Town Restaurant in Honolulu. “Crazy Rich Asians” star Awkwafina is one of four Asian American rappers featured in Salima Koroma’s documentary “Bad Rap,” a San Diego Asian Film Festival and Tribeca Film Festival selection. They want labels (of the recording variety), but they resist being labeled (as Asian American rappers). The film doubles as an introduction to the short historical arc of Asian American rap, beginning from the pre-YouTube days of the Pinoy hip hop movement, which started in the 1980’s. Konrad Aderer’s “Resistance at Tule Lake,” just announced as an educational release by Third World Newsreel, sheds some light on a somewhat unknown chapter in American history: its treatment of the Japanese population stateside during World War II. Though the film’s focus is on a single camp, Tule Lake, the tales told by the survivors could have come from any of the internment camps that dotted the American landscape. The articles linked in the text above were written by several Meniscus Magazine contributors: Rex Baylon, Christopher Bourne, Yuan-Kwan Chan, Jim Higgins, Eric Hung and Paul Kazee.